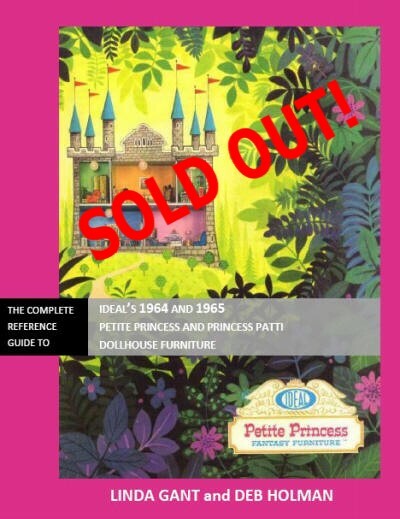 The First Edition of our very popular 1964 Petite Princess Furniture Guide has SOLD OUT in the USA and over 15 countries! But wait . . .
Our Second Edition Will Be Available Soon! We are publishing a Second Edition with new photos, additional materials, and tips for adding to your collection for release in May 2019. In the meantime, those of you who who wish to be added to our 2019 Edition Pre-Order List, please send us an email to the address below. 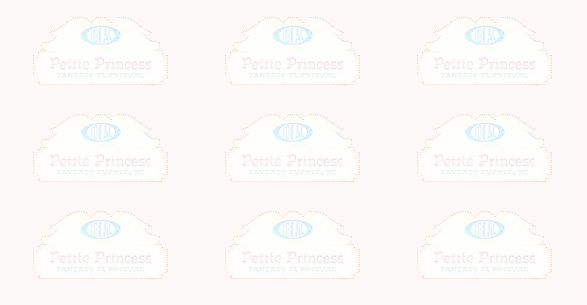 Also, an Amazon Kindle Edition of our popular 205-page Petite Princess Reference Guide will be available online at www.lulu.com at a very low cost in May 2019. 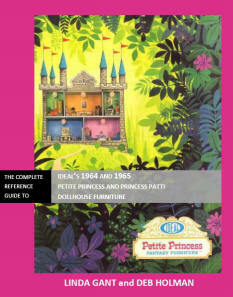 The Complete Reference Guide to Ideal’s 1964 and 1965 Petite Princess and Princess Patti Dollhouse Furniture is a comprehensive guide to Ideal’s Petite Princess and Princess Patti Dollhouse Furniture collections, featuring information and pictures on these exquisite dollhouse furniture lines. Included in this all-inclusive reference guide are historical insights into the marketing of Ideal’s Petite Princess and Princess Patti products, theory on the demise of the Ideal Toy Corporation, commentaries and collections of present-day “princesses,” identification tips, full-color inventory sections on Ideal’s Petite Princess and Princess Patti Furniture lines, and tips on how to find these products in mint condition. Linda Gant and Deb Holman have spent over six years collaborating together on this all-inclusive and comprehensive production. Most of the photographs were taken from their extensive Petite Princess and Princess Patti Collections and reflects the love and happiness that both have had playing with and collecting these magnificent dollhouse furniture pieces. Both Linda and Deb found, that there's no greater enjoyment than being a Princess! Through this wonderful book, they hope that you will, too! Tips on buying mint-condition PP furniture online and much, much more! The MOST Complete and ONLY Reference Guide to Petite Princess!!! But, Our Second Edition Will Be Available Soon! Please email presale@petiteprincessbooks.com to be added to our 2019 Edition Pre-Sale List. order lost or damaged during postal shipping, if the package is not insured. Insurance Available On U.S. & Multiple Foreign Orders.